Let's be real, when you go to a craft beer fest, you're going to drink a lot of good to great beer, some are going to completely miss the mark and there will be a few times you're completely blown away by something. 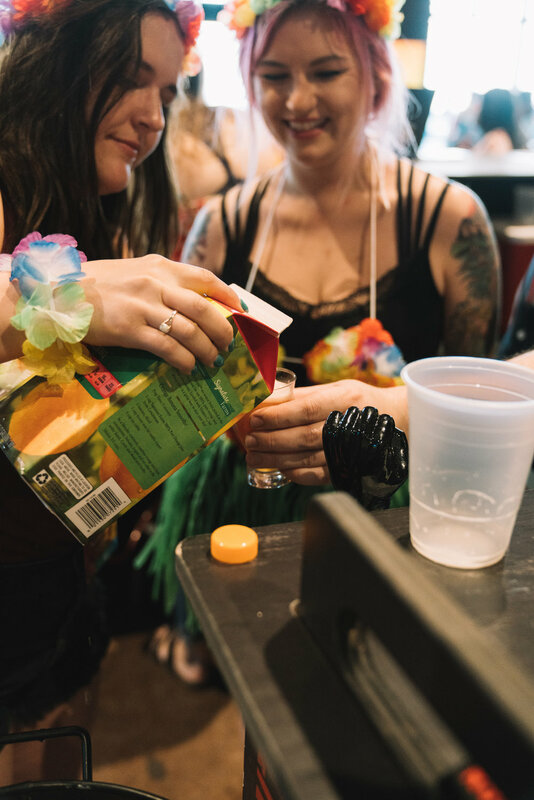 While at Good Libations Beer Fest, Illinois Craft Beer Week's closing event, we were blown away by Revolution Brewing's Rosamosa — simply, half orange juice and half Rosa, the brewery's seasonal hibiscus ale. 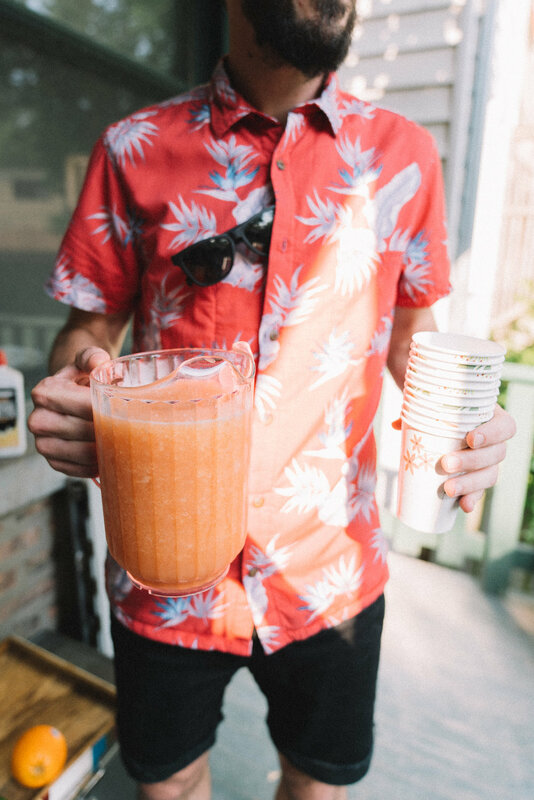 It was slightly tart, citrusy, refreshing and a beautiful rosy orange color, the perfect summer drink. Was it perfect though? This was the question I couldn't get out of my head when planning our Summer Over Beer kick-off BBQ. I knew Rosamosa on its own would be a guaranteed crowd pleaser, but it would also be a lot more fun to serve a beverage of our own creation. While walking to get coffee one morning, I asked myself, "What if we froze it? Would that work?" Sure, it would be a little more unique, but essentially the same drink we had at Good Libations. So, alright, let's think. What pairs well with citrusy hibiscus? Lime. To call it a true beer cocktail though, we would need to incorporate liquor, and with lime in the mix now, why not Tequila? Nothing ever goes wrong with Tequila. 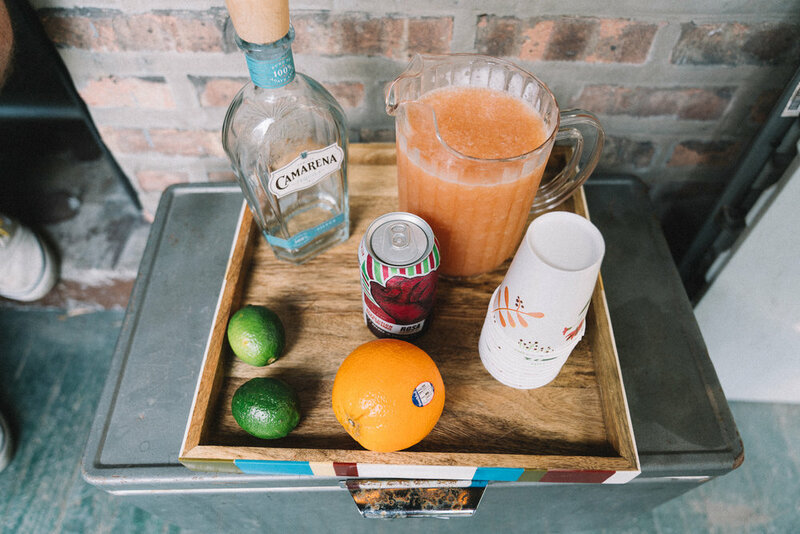 Frosamosarita is born — frozen, part Rosa, part mimosa, part margarita. The end result has a grapefruit-like tartness. It's boozy and refreshingly icy. It's also super easy to make and serve. In the large plastic bowl, mix together 2 cans of Rosa, 12 oz. of orange juice, 4 shots of Tequila and the juice squeezed from 1 and a half limes. Place the mixture in your freezer, and let sit overnight. When ready to serve, take the mixture out of freezer and scrape with spoon until entire bowl is filled with thin ice shavings. Transfer the ice shaving into the pitcher you will be using to serve your Frosamosarita, and mix in another can of Rosa, 6 oz. of orange juice, two shots of Tequila and juice squeezed from half of a lime. Make sure it's consistency is slush. Slice the 3rd lime to garnish with, serve and enjoy!